Do you know that feeling when you’re sure you’re onto something good? That’s what I thought when I first heard Andrew Heath’s music and have been very happy to help release his work for the last four years. I’m even happier to be working on a collaboration with him which will result in a new album by us next year, and which has already led to a series of live performances over the last 12 months. 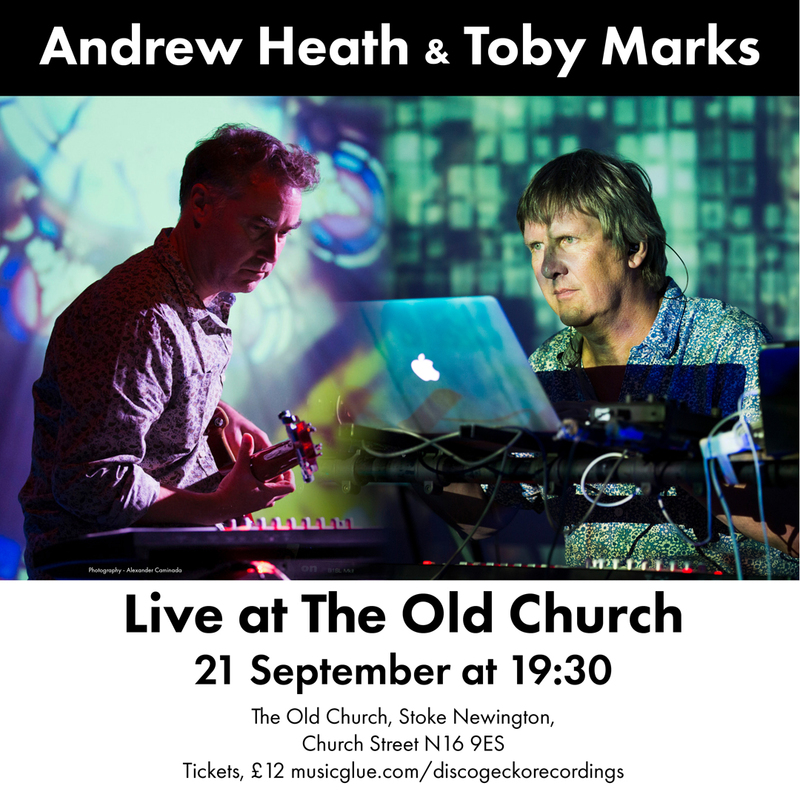 Following our sold out show at the Silk Mill in Frome in July, our next gig is at The Old Church in Stoke Newington, London on Friday 21st September, which will be another step forward as we unveil more of what we’ve been working on. I’m more excited about this project than anything I’ve done for a while and I think audience response is backing this up. Yes, we’re definitely onto something good here! For those of you in the west country, we’re also playing together in Exeter on Sunday 4th November at The Voodoo Lounge. Ticket links for both these shows are at the bottom of the email. Following on from the phenomenal response to my 20th anniversary CD offer, I’ve decided to keep the deal running for a bit longer. It’s been great to see so many of you choose non Banco titles, as my label and the work we release on it mean so much to me and I love sharing it with you. For those of you missed the last message – you can get any 5 discs from the Disco Gecko back catalogue for £20 + p&p from discogecko.com/product/20th-anniversary-bundle/. My latest radio show for Glastonbury FM is now up on Mixcloud and, should you wish to hear tracks from previous shows in full without me talking, I’ve started adding them to a playlist on Spotify.